Innovation is not optional. It's a must. The acceleration of change and scale of disruption from data, digital technologies, globalization and other forces means organizations have to evolve to survive. For EY Advisory, a better working world means solving big, complex industry issues and capitalizing on opportunities to help deliver outcomes that grow, optimize and protect our clients' businesses. We know that because we've helped countless clients to innovate. EY is subject to the same threats though. And we've also had to adapt. So we've taken our heritage of entrepreneurship and innovation, reinvented it, and put it at the heart of our services – so you, and we, can stay on top. We call it Innovation Realized. Our innovation approach is based on the premise that innovation is the art of making hard things easy. We work with you to build new business offerings by sharing, honing and deploying new approaches, tools and services, and turning local practices into global best practices. We're constantly evolving to help you drive your business forward, turning threat into opportunity. Working together, we can help you design better outcomes and deliver long-lasting results. EY launches EY wavespaceTM, a global network of growth and innovation centers to help clients navigate the transformative age. How do you improve the health of health care providers? We helped a diversified health care provider work better by helping to design and implement a common, customer-focused innovation process that accelerated its innovation cycle from eight months to eight weeks, improved quality of care and saved money. When is an ounce of prevention worth a pound of cure? We helped a global research organization work better by helping it refresh its business plan assumptions and forecasts, evaluating competitor offerings and documenting implications for a new business offering that focused on preventative health and wellness. How do you scrub the germs away? We helped a global medical device manufacturer work better by helping estimate market size, defining a strategy and designing governance, enabling it to increase the value of its innovation portfolio by more than 100% in its effort to halt the spread of health care-related infections. How do you get the heart pumping when the arteries are clogged? We helped a medical device manufacturer work better by conducting a rapid market opportunity assessment to help define business model innovations that enabled the company to think differently about its cardiology business. We strive to help you create a legacy of improved business performance, confidence and trust. We believe that clients need consultants who can take a broader view to find opportunity in a world that's as exciting as it is unpredictable and uncertain. Because the better business works, the better the world works. We choose the right people and connect you to our leading innovation program in your territory, and also to our global program which launches multiple new innovations each year. Increasingly clients want from us new and innovative services, capabilities and assets such as tools, data, analytics or content. There's also growing demand for teaming in different ways, such as annuity-based or value-based services. We help you develop new IP, or leverage others' IP so you stay abreast of changes and work better in your sector. And we support this via our global innovation framework and portfolio management process, which means our services and delivery remain relevant and can address your emerging issues. And to push this forward faster, the whole of EY is driving new services, new delivery models and first mover opportunities via our global innovation program. For EY Advisory, a better working world means solving big, complex industry issues and capitalizing on opportunities to help deliver outcomes that grow, optimize and protect our clients' businesses, now and in the future. We help you to be better business innovators, so great ideas become better business outcomes. We then team with you to figure out how best to measure and evaluate the success of each innovation. We can leverage our agile innovation methodology to help you speed up your processes. We can build upon innovation we've captured from our experience in your global marketplace, or support you to further hone or adapt an already successful innovation program. We can equip you with the tools to look across your entire organization for opportunities. We can identify new and better systems, processes and metrics around innovation. And we work with you to fine-tune your innovation capabilities through collaboration. Overall, we can help you understand that innovation is about continuously learning and adapting, differentiating yourself and making innovation a reality every day. 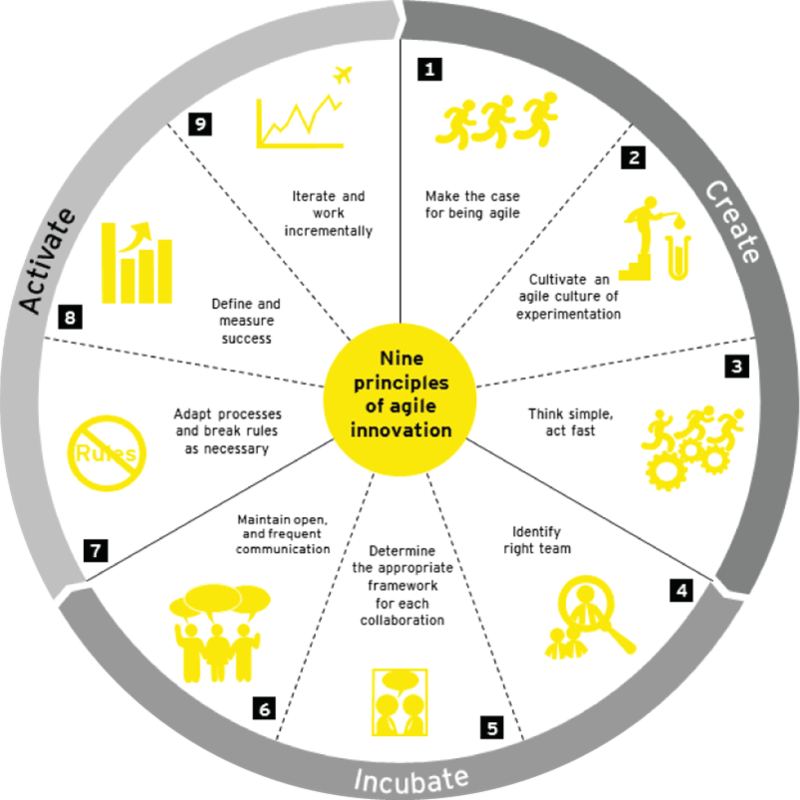 When the world is in motion, how do you anchor your innovation strategy? We help you place innovation at the heart of your organization's purpose – transforming experiences, business models and processes. For example, we created a growth and innovation strategy for a diversified industrial manufacturing company and helped a technology vendor create a strategy to embrace new business models. EY is being impacted by the same megatrends. The professional services industry is undergoing a significant transformation. That's why innovation is one of our global priorities in our vision to help build a better working world. We have established a global innovation strategy and approach with a focus on innovating new services, delivery models and first mover opportunities. Based on our own experiences, we work with you to embed innovation in your culture and embrace the agility needed to create, incubate and activate innovation. Focusing on driving today's innovation? Networking to identify tomorrow's ideas? We can help you build the right network to drive and realize innovation faster. For example, we regularly run innovation training and facilitate workshops for our clients, conduct innovation retreats that bring together leading minds in innovation and speak at innovation conferences. At EY, the internal innovation network includes all our personnel, because we believe good ideas can come from anyone at any time. Our global innovation capability synchronizes the internal network across service lines and regions to help connect the dots at the right time and the right place. In addition, we are orchestrating an evolving external ecosystem where we drive co-innovation with alliance partners such as P&G, SAP, IBM and Microsoft. We are also connected with next generation companies through our EY World Entrepreneur Of The Year™ program and our start-up challenge programs. 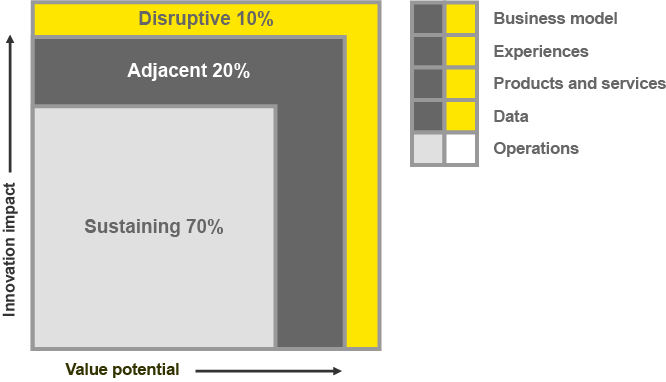 Choose between sustaining, adjacent or disruptive innovation? Outperform with a portfolio approach? We work with you to design a portfolio that includes the right mix of sustaining, adjacent and disruptive innovation. We help you manage innovation as a portfolio to best mitigate the challenges that surround innovation based on our learnings through numerous engagements. We help you to assess and design your specific portfolio management approach, identifying the right mix of sustaining, adjacent and disruptive innovation based on your industry, selected growth ambitions and risk profile. Additionally, we collaborate with you to help you establish the related metrics to measure those innovations and track the overall performance of your innovation portfolio. 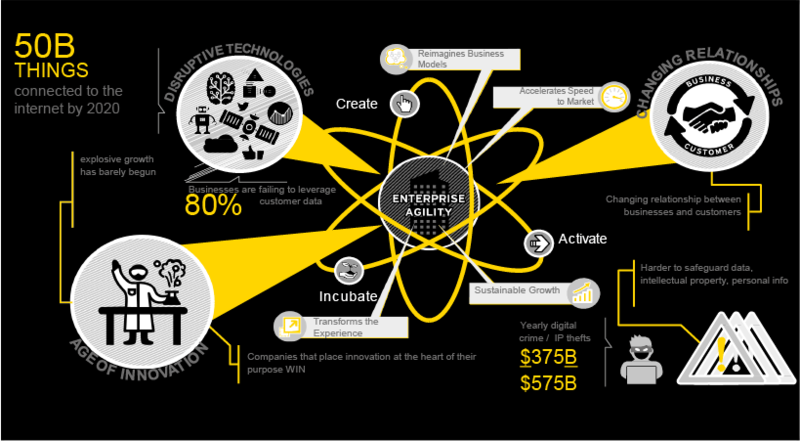 At EY, our global innovation framework and portfolio management process connects new and innovative practices from around the world. It is also the source of our own global innovations. There are currently more than 80 global innovation items in our portfolio that are tagged as adjacent or disruptive innovations. If innovation is to become part of your DNA, how does your culture need to evolve? We help you leverage approaches, processes and tools that can cultivate innovative thinking. We work with you to embrace the imperative that successful innovation does not come from technology; it comes from people. Leading companies find, connect and empower great minds by providing an environment that facilitates the freedom to think and develop innovative solutions. We support you design and implement the governance and processes that can foster such a culture. We've created a global innovation capability focusing on engaging and empowering everyone. We work hard to understand our clients' issues and are driven to ask better questions in the pursuit of helping make their businesses work better. Who is going to disrupt your market and how will they do it? What will it take to move you from defensive to proactive to outmaneuver the competition? Who should you be partnering with to avoid extinction tomorrow?